In twilight they passed bloody Tadoussac, Kébec, and Trois-Rivères and near dawn moored at a remote riverbank settlement. Captain Bouchard consulted his letters. "Michelle Sarrazine. You understand, Mari's fame in curing the sick and injured has reached as far as Kébec. We are not so pitiful here in Wobik as some think. Although she is only a Micmac Indan." 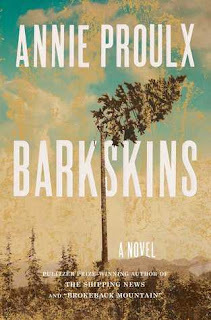 Synopsis of Barkskins by Annie Proulx: 'One of the greatest American writers' Independent From Annie Proulx, the Pulitzer Prize---winning author of The Shipping News and "Brokeback Mountain," comes her masterwork: an epic, dazzling, violent, magnificently dramatic novel about the taking down of the world's forests. In the late seventeenth century two penniless young Frenchmen, Rene Sel and Charles Duquet, arrive in New France. Bound to a feudal lord, a "seigneur," for three years in exchange for land, they become wood-cutters - barkskins. Rene suffers extraordinary hardship, oppressed by the forest he is charged with clearing. He is forced to marry a Mi'kmaw woman and their descendants live trapped between two inimical cultures. But Duquet, crafty and ruthless, runs away from the seigneur, becomes a fur trader, then sets up a timber business. Proulx tells the stories of the descendants of Sel and Duquet over three hundred years - their travels across North America, to Europe, China, and New Zealand, under stunningly brutal conditions; the revenge of rivals; accidents; pestilence; Indian attacks; and cultural annihilation. Over and over again, they seize what they can of a presumed infinite resource, leaving the modern-day characters face to face with possible ecological collapse. Proulx's inimitable genius is her creation of characters who are so vivid - in their greed, lust, vengefulness, or their simple compassion and hope - that we follow them with fierce attention. Annie Proulx is one of the most formidable and compelling American writers, and Barkskins is her greatest novel, a magnificent marriage of history and imagination. I've never read anything by Proulx so I'm really excited that I was offered this for review. I've heard only raves of The Shipping News, which won Proulx a Pulitizer. I've also watched the movie version of Brokeback Mountain and was impressed on all fronts. I guess we'll see how my first Proulx will go! Have you read anything Annie Proulx? Any favourites? Does this one appeal to you?